Somalia, in the Horn of Africa, has experienced changes and shifts in governance, security, development and the humanitarian environment over the past two decades. The estimated population is around 12.3 million, with 2.8 Somalis living in rural areas and 5.2 million (about 42 per cent of the total population) living in urban areas. Around a quarter of the population are nomadic. Estimates from the United Nations High Commissioner for Refugees (UNHCR) indicate that over 1.1 million Somalis are internally displaced. The country has been on a humanitarian crisis footing since the 1990s when war broke out and is one of the most complex and long-standing emergencies in the world. It is characterised by sustained high rates of mortality, child malnutrition, severe basic services shortfalls and large-scale population movement. The prevalence of acute malnutrition in children under five years old (CU5) is over 15 per cent, which is above the emergency threshold, and the prevalence of stunting is estimated at 23.5per cent. 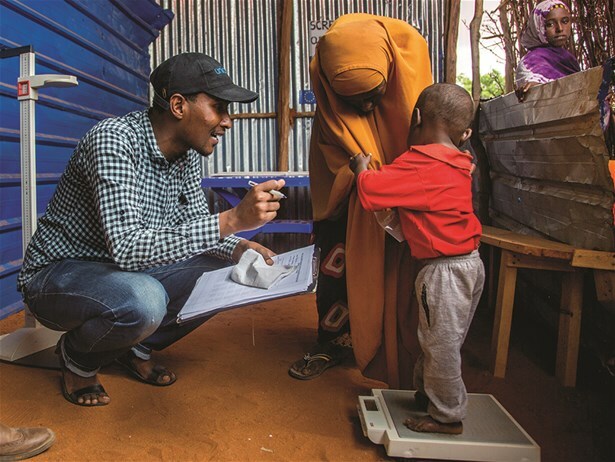 The health status of Somalis is critical, with the country registering among the poorest health and mortality indicators globally, including mortality rates of 136 per 1,000 live births and maternal mortality at 732 per 100,000 live births.